A few years ago after Christmas they had smoked hams clearanced out at the grocery store. I couldn’t pass up a $5 hunk of amazing meat. So I bought one. Ever since then I’ve made ham throughout the year. Not only does it make an amazing dinner but I have a bunch of leftover ham recipes I use too so one piece of meat can last us a few night typically which saves a lot of money and the taste is amazing. Here’s how easy it is to make an Instant Pot ham. You just need 3 ingredients and with the time it takes to reach pressure and naturally release the pressure it is done in about 20 minutes flat! 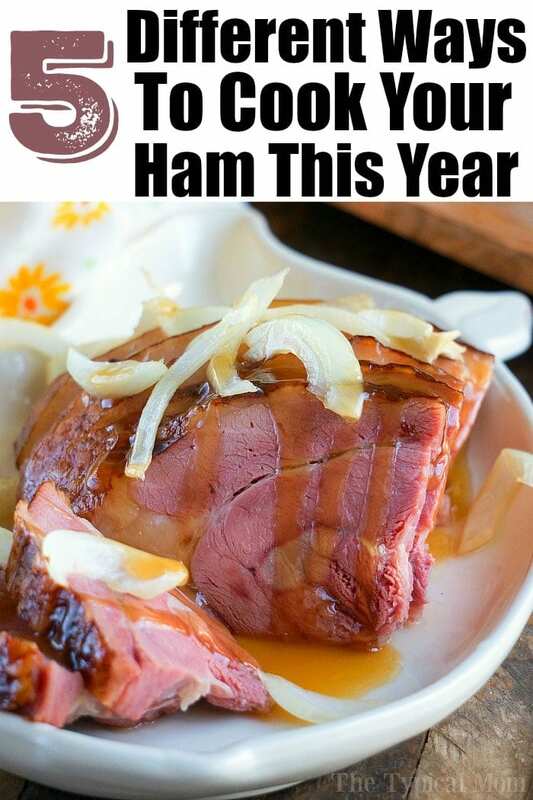 Quarter of a ham – near the holidays you typically find bone in ham cut in half. In my 6 quart Instant Pot that wouldn’t fit. But a quarter ham fit perfect. If you can only buy a half then cut it in half and you’ll have 2 dinners to make. Or you could ask your butcher if you can buy just half. Many times that is possible if you just ask. A spiral cut ham is best. I had to slice ours myself. 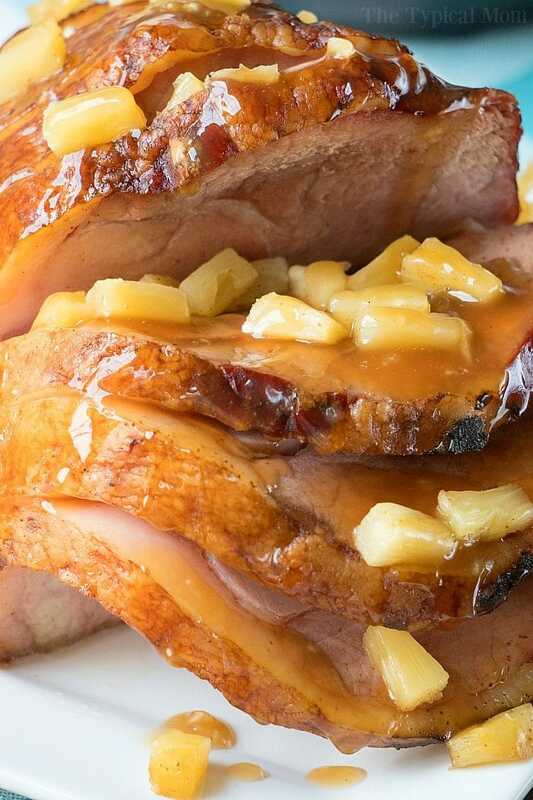 If you want to thicken the ham glaze then you’ll need some cornstarch too, that is up to you. Why would you cook ham in an Instant Pot rather than the oven? This is what it will look like before you lower it on to your trivet, the foil creates a sort of bowl to hold in the juices etc..
You’ll want to slice your ham if it isn’t already, ours wasn’t, and then put it in a large piece of foil that will kinda’ act like a bowl holding the pineapple, sugar and juices. Ham almost always when bought in the store are already cooked, you’re just warming them up. Typically pre-cooked hams you buy in the store are smoked, like ours. So it will come with some of that flavor as is but adding the fruit, juices, and sugar gives it a sweetness that is great. I made the glaze with the juices that were at the bottom of the pot. Just set to saute and added a bit more brown sugar. Add cornstarch to thicken it up while whisking it up as it bubbled. A few people ask how to make this pressure cooker ham without using foil. I have NOT done this myself but this is how I think I would make it minus the tinfoil. Pour over ham and serve! So…you literally don’t need anything else and I will tell you it is so good! My husband even said that he’d rather have it this way for Christmas rather than putting it in the oven. It steams nicely leaving all the juices in tact and absorbing some of that sweetness while it cooks in your pressure cooker in just 10 minutes! If you have an 8 qt. Instant Pot you may be able to fit more than a quarter ham. If so I might increase the time by 5 minutes or so. If you’d like to make a crockpot ham recipe this time or next we have that as well as a dutch oven ham recipe. Or if you prefer turkey here’s instructions on making a pressure cooker turkey for the holidays. If you’re making this for the holidays because you’re not a turkey fan we have other Instant Pot Thanksgiving recipes here. There are many Christmas brunch menu ideas here as well. How long to cook your ham in a pressure cooker? This depends on the size you have, 12 minutes worked well for ours. Once you’re enjoying this you probably won’t have any left but if you do then try our leftover ham recipe as well as putting some in these copycat Starbucks sous vide eggs for breakfast. 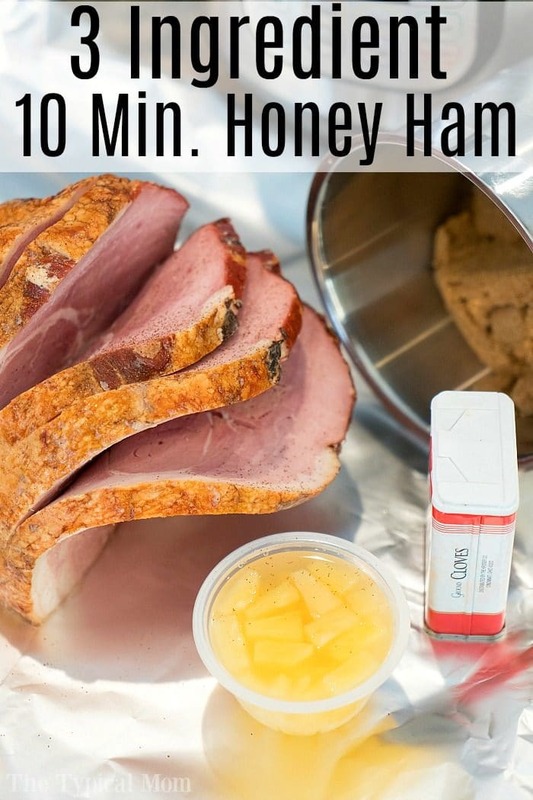 This is the most amazing Instant Pot ham done in just 20 minutes! 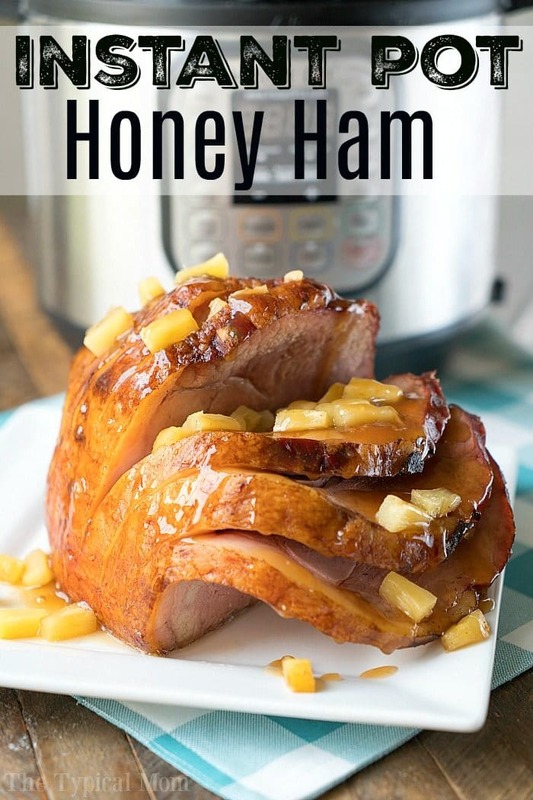 If you want an easy honey ham recipe you've gotta' try it in your pressure cooker. 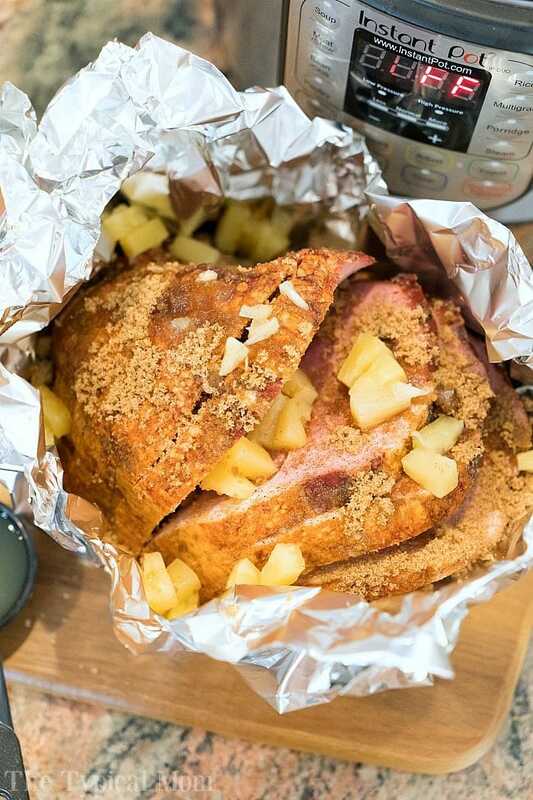 Slice your quartered ham if it isn't sliced already and put it in 1-2 large pieces of foil (large enough to wrap all the way around it - may need small piece for very top as well). Add 1.5 c. of water into your Instant Pot and add trivet to bottom. Lower ham into pressure cooker on to your trivet (make a sling to put on bottom to lift it back out if your trivet doesn't have handles). Close lid and steam valve. Set to high pressure for 12 minutes (timing will vary slightly according to how large your piece is, this is for a quarter ham that's been sliced). Do a natural release for 10 minutes when done. In a small bowl add maybe 2 oz. of pineapple juice and 2 tbsp of cornstarch and whisk together....add 1 tbsp at a time to avoid clumping. Dump this "thickener" into your Instant Pot and stir/whisk together consistently until it is the consistency you want. Add more pineapple juice or a bit more cornstarch mixture if desired but will thicken in no time. Finish slicing ham pieces all the way through, pour glaze over the top of each piece and serve! Well, we tried to get brunch reservations for Easter, but everything was booked, so now I’m going to make a ham. Your ham!! I love that I can make it in the Instant Pot! This turned out amazing, and I am so excited I can make ham in 30 minutes instead of hours, ha ha ha! Ham was not as hot as I would’ve liked. Less than 3 lb boneless precooked. Did you slice it as directed? If not it wouldn’t heat through. This version of ham reminds me of the one I grew up with. The glaze is just gorgeous! I’m excited to try it. Thanks for the recipe! OMG I made this tonight for Thanksgiving. Ham was amazing. The glaze was to die for! Thank you for this recipe!! Going in my Holiday Cookbook!! Yeah!!! I am so glad you loved it too! So these directions are for a pre-cooked ham? I live in Ireland, and ham here is not pre-cooked. Yes, I am unsure for precooked as anything you buy here would be. You may have to experiment but for a quartered ham I would probably cook for 30 minutes on high and then check the internal temp. to see how much more time to add. Whay would conversion be for crock pot? Or oven? 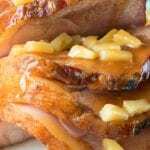 There is a link in the post for crockpot ham. This is awesome, except I do not like to cook in foil for fear of leaching aluminum into our food. Can you cook this in parchment paper and get the same result? My initial thought would be to put 1.5 c. liquid in the bottom with a trivet and set the ham directly on that. Then when done follow my directions on making the glaze in your pot on saute. My initial thought would be to just put the ham by itself on a trivet with 1.5 c water in the bottom, then make glaze after that when ham is done and you take it out. What can I use in place of the foil? I prefer to not cook my food in it. I love my IP, it makes cooking super easy and simple. This recipe is perfect for the holidays! I could really fool my family and friends into thinking I slaved over dinner (but didn’t) with this recipe. This is a great recipe idea for going into the holidays!